Brunton portable power SolarRoll is a flexible solar panel that produces 14 watts of power with a loaded current and voltage of 15.1V. The SolarRoll weights 19.5 oz and offers reverse current protection and is designed to operate in a temperature range of -22°F to +122°F (-30°C to +50°C). The Brunton SolarRoll consists of 18 solar cells and will produce power when any of these segments are exposed to sunlight. This means that the panel can be partially unrolled and still utilize the power provided. Each segment produces an average of 50mA. To calculate the amount of power a panel will produce when partially unrolled, count the number of segments that you have rolled out and then multiply by 50mA. The voltage stays the same when rolled out entirely or partially. 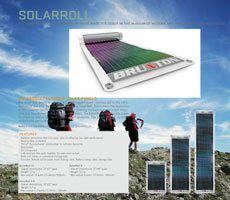 Fully extended, the Brunton SolarRoll14 produces 900mA. It can also be linked to another Solar-Roll to double the current output. The Brunton SolarRoll14 is waterproof and can be submerged all the way up to the electrical connectors and not be damaged. Avoid getting the electrical outlets wet. This could cause a direct short of the panel and may permanently damage your product. For positioning, unroll the Brunton SolarRoll14 with the solar cells facing up or secure the panel in place with the grommets provided around the exterior edge of the panel. Position the panel so that it can receive the maximum amount of sun exposure. Plug into the panel with the cables provided. The Brunton SolarRollcan be left plugged into any device overnight without it draining the battery because of the built-in reverse current protection. As caution, always position the panel first, and then connect the device being powered. If these steps are accomplished in the reverse order, damage may occur to the device being powered. If using the Brunton SolarRoll to power a battery charger, do not attempt to recharge non-rechargeable alkaline batteries. This panel should always be rolled lengthwise with the solar cells facing out . It should never be rolled tighter than 3 inches in diameter. Rolling this panel in any other way will void the 1 year warranty.